The Mt. 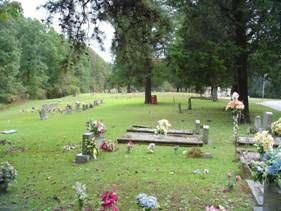 Olive Cemetery is located in the far western area of Lauderdale Co., Alabama. To reach the cemetery, from Waterloo, AL, travel County Road #45 aka Pea Ridge Rd. for 4.1 miles. Turn left onto Union Hollow Rd. & travel 3/10 mile and keep to the left as Union Hollow Rd. curves left. The largest part of the cemetery in on the left and a smaller portion on the right side as the road curves to the left. Mt. Olive Church was established in 1881. Many of the graves predate the establishment of the church. There are many, many graves without identification. The oldest known birth date is that of Sarah Parker, having been born January 15, 1810. Decoration day at Mt. Olive is the third Sunday in May of each year. Enumerated by David & Martha Montgomery on October 15, 2013. Beckham, Margaret; b. 27 Feb 1839, d. 29 Jan 1921, wife of S.R. Brannon, Gladys Lee; b. 14 Apr 1946, d. 28 Nov 1950, daughter of C.B. & M. B.
Bugg, James Rayford; 04 Feb 1945, infant son of Mr. & Mrs. F.A. Bugg Jr.
Franks, William Thomas; b. & d. 24 Feb 1885, son of T.F. & S.E. Hairell, Cynthia B.; b. 17 Oct 1873, d. 25 Dec 1894, wife of G.W. Hairrell, infant; b. & d. 20 Jan 1904, daughter of H.W. & H.R. Hairrell, infant; b. 20 Mar 1917, d. 02 Apr 1917, daughter of H.W. & H.R. Hairrell, Lillie D.; b. 18 Oct 1880, d. 07 Jun 1922, wife of A.B. Highland, Hazel Mae; b. 30 Sep 1948, d. 08 Jan 1949, daughter of H.R. & A.L. Jones, Gladys (Austin); b. 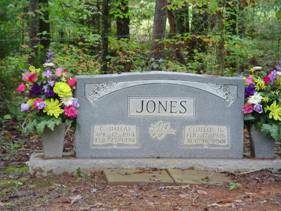 14 Aug 1894, d. 18 May 1965, wife of W.C.
Jones, Hulete; b. 28 Sep 1916, d. 06 May 1920, son of W.C. & V.E. Lard, Patti Rena; b. 21 Jan 1965, only date, daughter of H.E. & S.E. Mansel, Martin; b. 29 Nov 1895, d. 30 Sep 1945, Alabama Pvt. 1st CL 306th Sup. Co.
Mansel, Paul m.; b. 28 Jun 1922, d. 28 Dec 1991, son of Linnie A.
Parker, Catherine; b. 12 Dec 1833, d. 10 May 1905, wife of Jasper N.
Parker, Ida V.; b. 20 Apr 1860, d. 20 Jul 1888, daughter of J.? & C.
Parker, Mary Elizabeth; b. 05 Dec 1863, d. 24 May 1940, wife of T.C. Parker, Ora; b. 15 Jun 1875, d. 15 Apr 1910, wife of Luther A.
Parnell, Oma M.; b. 24 May 1908, d. 08 Feb 1919, child of E.R. & D.L. Parnell, Turner W.; b. 21 Jun 1905, d. 21 Jul 1907, child of E.R. & D.L. Qualls, James R.; b. 20 Jun 1920, d. 02 May 1945, Sgt. Co. “G” 337th Inf. killed in Italy 02 May 1945, son of J.R. & Linda B.
Retherford, John G.; b. 04 Jul 1894, d. 04 Jun 1919, son of J.M. & N.M.
Retherford, Nancy M.; b. 07 Aug 1871, d. 09 Jun 1929, wife of J.M. Robbins, Infant; b. 18 Oct 1917, d. 22 Oct 1917, son of L.E. & A.P. Robbins, Minnis F.; b. 18 Jun 1899, d. 14 Sep 1904, son of J.W. & I.V. Shaw, S.A.; b. 25 Apr 1832, d. 11 Jan 1903, wife of G.W. Skinner, J.B.; dates not legible, son of T.H. & S.A.E. Skinner, Lizzie C.; b. 02 Mar 1876, d. 07 Aug 1904, wife of Thomas D.
Skinner, Martin H.; b. 05 Jun 1860, d. 30 May 1873, son of T.H. & S.A.E. Skinner, Rosie Lee; b. 16 Oct 1916, d. 28 Feb 1918, daughter of T.D. & R.C. Skinner, S.A.E. ; b. 07 Dec 1832, d. 04 Aug 1900, wife of Thomas H.
Turner, Minnie E.; b. 20 Mar 1902, d. 05 Mar 1905, daughter of J.T. Jr. & D.E. Turner, Thomas E.; b. 21 Jan 1903, d. 09 Oct 1906, son of J.T. Jr. & D.E. Turner, Vernetta O.; b. 27 Mar 1900, d. 23 Feb 1901, daughter of J.T. Jr. & D.E. Turpin, Billy; no dates, son of John W. & Tishie L.
Turpin, Mertie; no dates, daughter of John W. & Tishie L.
Turpin, Zellie; no dates, daughter of John W. & Tishie L.
Webb, Lucinda C.; b. 07 Nov 1830, d. 21 Jul 1895, wife of W.J. Webb, Sallie; b. 26 Mar 1862, d. 12 Apr 1927, wife of J.B.